Now we will be packing for 3! We are excited to announce that we are expecting! Angela is 13 weeks pregnant and doing great. We are humbled, anxious, and honored to be bringing life into this world. Many of you know that the road to starting a family has been a long and painful journey and we rejoice all the more for this huge blessing. We know that the Lord will continue to provide for us as He has so far. This incredible news also comes with a couple of changes and we deeply long to get to Bogotá before our precious baby makes his/her appearance. – With the anticipation of a new little one, our budget is increasing proportionately to be able to care for a family of three. 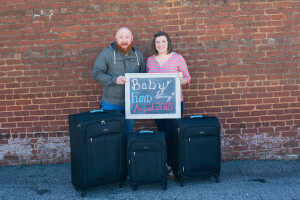 – To comfortably move and get settled before baby is due August 24th, we would need to move by the end of April which would be during Angela’s second trimester. We still need to get to 100% of our new budget before we can leave for Bogota. 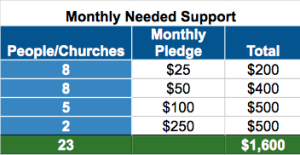 To do this, we need families like yours to pledge to give monthly or annually. We are honored to have donors that support us from $10 to $400 per month and everything in between. 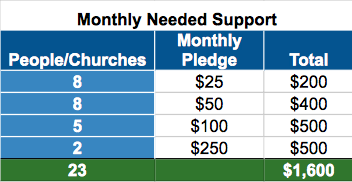 Here is an overview of the remaining monthly need. So please pray with us. May the Lord continue to bless the precious life He has blessed us with. May the Lord continue to provide for us so that we can move to Bogotá in this tighter window. Finally, may we have faith to believe that HE can do these things and so much more!